Individuals with a mutation in a gene involved in nervous system development have reduced connectivity between regions of the brain's reward system, finds a study of a four-generation Canadian family published in JNeurosci. The DCC gene directs axons where they need to go in the developing nervous system. Previous research in rodents has found altered pathways between the limbic system and the cortex in mice with a faulty copy of the DCC gene that results in a reduced response to stimulants such as amphetamine. Extending these findings to humans, Marco Leyton, Cecilia Flores, and colleagues found similar connectivity differences in 20 DCC mutation carriers compared to two control groups of 16 related non-carriers and 20 unrelated healthy adults. 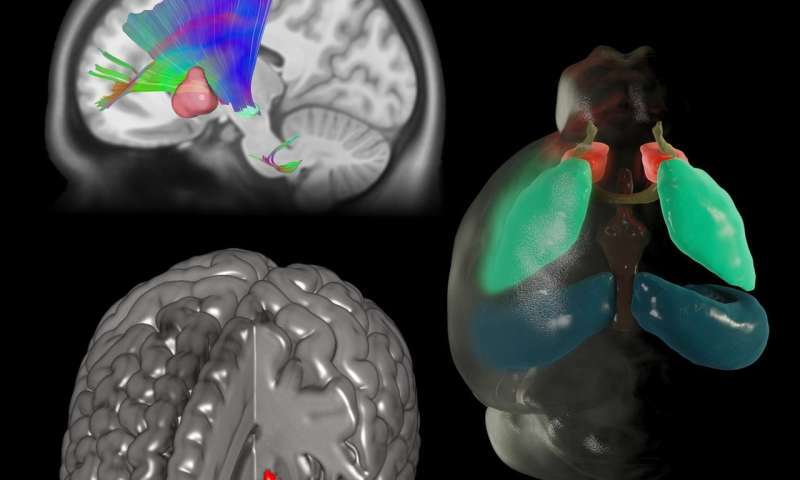 The researchers found that those with the mutation showed reduced connectivity among the substantia nigra, ventral tegmental area, and frontal brain regions as well as reduced volume in the striatum (a finding that was confirmed in mice). Analysis of personality traits and substance use revealed that the mutation carriers were less impulsive and smoked cigarettes less than non-carriers.